Anxiety results from excessive fears and anticipation of a future threat. Anxiety may often be described by words such as stress, worry and nervousness. General daily stress and anxieties can be regulated through relaxation techniques, hobbies, exercise, entertainment or talking with a friend. Typically, after we engage in some of these activities our anxious feelings dissipate. In some cases, however, feelings of anxiety remain intense over a prolonged period and our lives become disrupted. Anxiety is classed as a disorder once the symptoms become chronic and affect our ability to function in our daily lives. Art therapy facilitates the ability for clients to express themselves visually and rely less on verbal expression which can be a difficult task if a client is engaging in catastrophising. Feelings of anxiety and being overwhelmed can make verbal expression difficult which then impacts the client’s perception of self-regulating emotions and thoughts. Art Therapy can provide techniques that will help the client feel calm and able to focus on the task at hand. Once the feeling of anxiety is defused, the client is then in a more stable state of mind to process thoughts, emotions and assess their behaviour. Additionally, art therapy can assist anxiety by improving self-esteem, facilitate emotional expression, problem-solving and assist in goal setting which aids in working towards improved thinking patterns. If you’re looking for some art therapy exercises for anxiety, check out one of our previous posts 10 Art Therapy Exercises for Anxiety. Summary of sessions to date: Norah has been attending art therapy sessions for the past 5 weeks and had explored some of the underlying issues surrounding her recurring feelings of heightened anxiety. This week Norah had discussed the idea of developing coping skills that she could develop to help her cope with anxiety in the future. 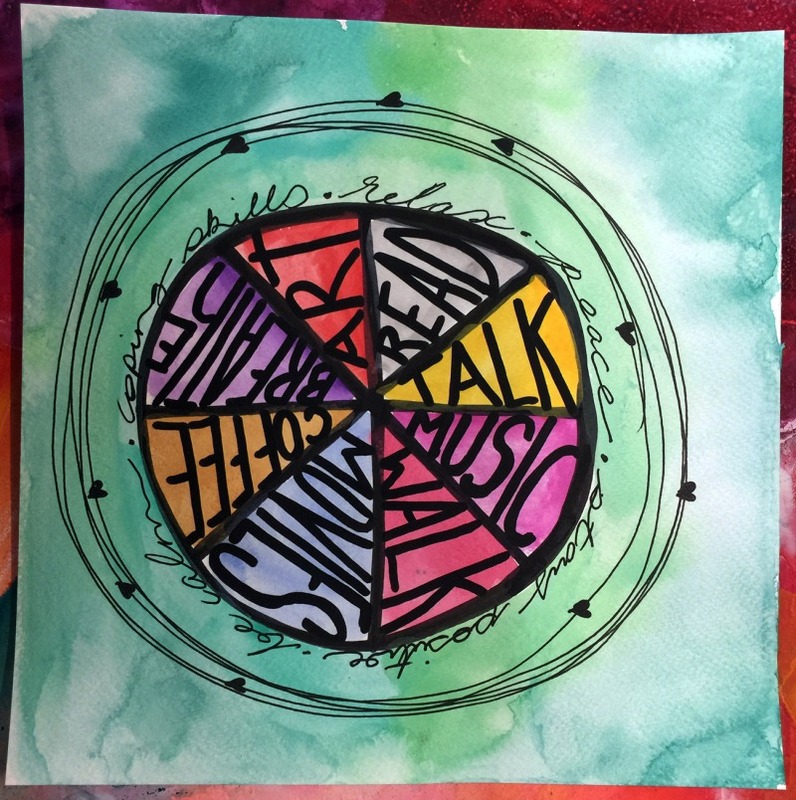 In her discussion with her therapist about developing coping skills, Norah wanted to create an art piece that would help remind her to engage in some of the positive activities that she could regularly use to help reduce her feelings of anxiety. Additionally, Norah wanted to use this as an exercise to remember the positive things she had in her life to help her develop a more positive and proactive attitude towards coping with stresses in her life. This exercise involves your client finding positive activities to engage in to reduce the impact of negative events in life. Your client should feel empowered that they have a range of coping skills to help alleviate anxiety and stress and consequently reduce the anxious feelings they experience. Identifying and labeling effective strategies helps your client rely less on reactive behaviour, and instead employ positive steps to successfully navigate through stressful situations. Discuss with your client the type of art supplies they may like to work with in this session. This exercise involves constructing a collage of your client’s favourite things or activities that helps diffuse stressful situations and relationship conflicts. As this exercise involves constructing a collection of images your client may wish to use collage techniques and collect images from magazines or free clip art from online sources (eg. http://www.freepik.com/). Alternatively your client can use their own drawing skills or create a collage based on powerful words. These words can also be cut out from other sources or hand drawn. Once your client has collected their art supplies and image sources, they can begin to constructing their collage of images that represent relieving anxious feelings . This exercise will help your client understand how managing stress on a regular basis can improve overall emotional stability. After your client has completed the art therapy exercise, you can discuss their choices of images and words that they believe will help manage stress in daily living. Discussion can focus on when to engage in these activities so that your client can feel empowered to be able to navigate through potential stressful events in the future. The client created a pie chart of activities they could engage in as relaxation techniques to cope with their anxious feelings. These activities could be used as a part of the client’s daily life. They could also be used when dealing with conflict and situations where anxiety levels increase. The artwork can be kept as one piece of it could be cut up into individual pieces of pie known as coping cards. These coping cards can be used by the client when they want to spontaneously engage in a stress reducing activity. 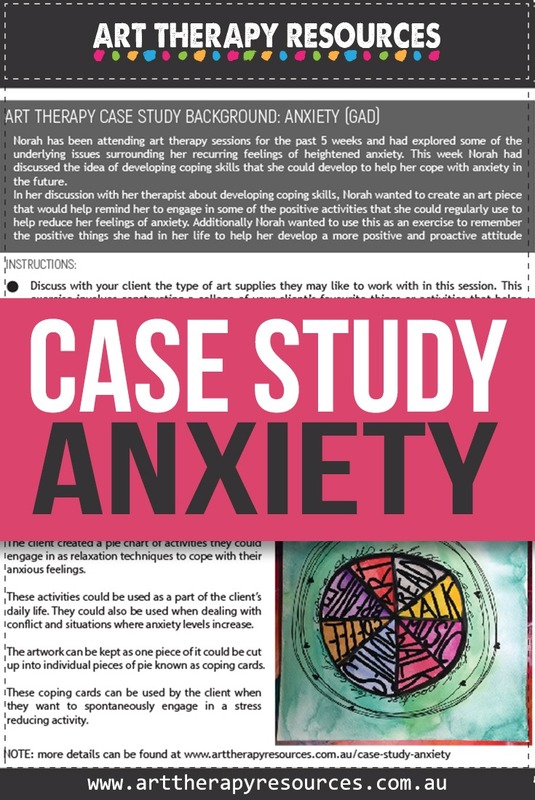 Download the FREE Art Therapy Exercise based on the above Case Study. 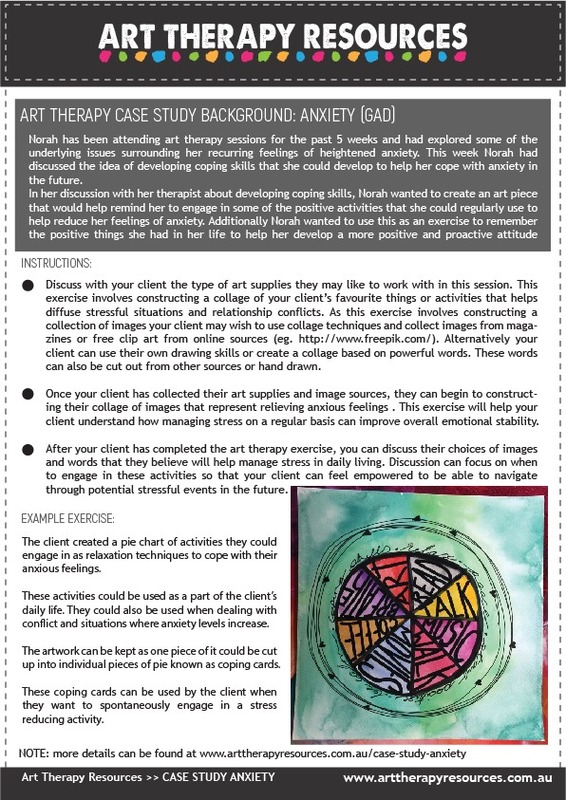 The free download includes instructions for the art therapy exercise as well as a sample image.